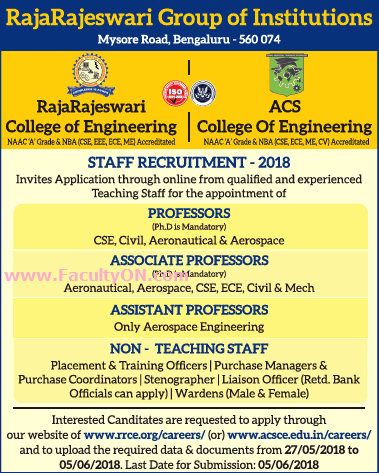 RajaRajeswari College of Engineering, Bangalore has advertised in THE TIMES OF INDIA newspaper for recruitment of Teaching Faculty- Professor / Associate Professor / Assistant Professor Plus Non-Faculty jobs vacancies. Interested and eligible job aspirants are requested to apply on or before 06th June 2018. Check out further more details below. About College: RajaRajeswari Groups of Institutions offers a very open and healthy academic environment, growth opportunities for its staff. We believe in raising the benchmark of quality of education, through an environment conducive for teaching and learning. Salary is absolutely no constraint for the right candidate.There are plenty of opportunities for research and development for them. How to Apply: Interested and eligible candidates are requested to apply online at the official web address provided here.